GV-ASManager oferece uma solução de rede de controle de acesso adequado tanto para pequenas empresas e multinacionais com instalações ao redor do mundo. GV-ASManager pode controlar até 255 unidades de controladoras e suporte para até 40.000 cartões. Além disso, os dispositivos de IP pode ser conectado ao GV-ASManager através da rede para proporcionar imagens ao vivo e evento associado. Note: GV-ASManager has ended supported for Windows XP and Vista. 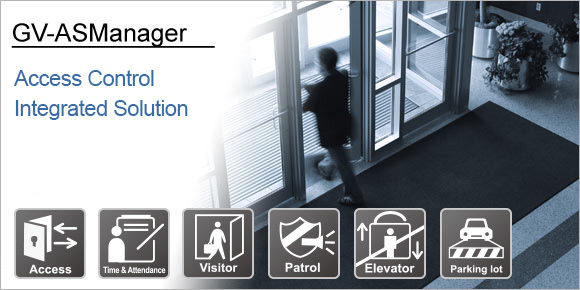 Along with powerful access controllers and other hardware accessories, GeoVision offers a series of complementary access control software including the GV-ASManager, GV-ASWeb, and GV-ASRemote, to provide the flexibility and scalability for both local and remote access control. 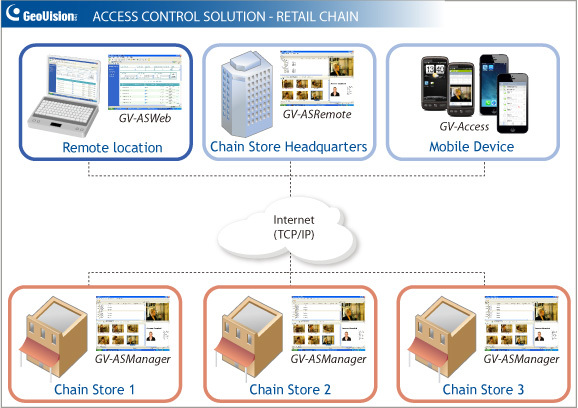 The diagram above shows how the access control software can be set up for a retail chain. GV-ASManager can be installed in local PCs of the chain stores and the headquarters can remotely monitor the chain stores using GV-ASWeb or GV-ASRemote.